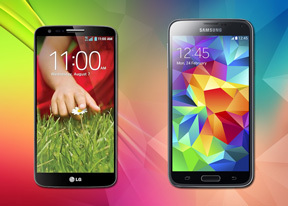 LG G2 is one of the most innovative smartphones. This super phone excels in both performance and features, exterior design and super smart user interface with hundreds of cool features and tweaks. the speed of the interface - time taken to open an app on this phone is so fast this great phone more in-depth. you will find this very enjoyable! As I’m. iam not a fan of sammy or lg but indeed my opinion is. everyone should be aware that last year august lg flagship is compared to recently released sammy flagship, this is enough to prove that what G2 is capable off. G2 has changed lg's game totally. i can prove that i have experience of both phones. g2 for 4 months and S5 for 3 weeks. Overall S5 is best compared to G2, but all the major upgrades in S5 just vary a small difference compared to G2. but in G2 battery is a monster and price OMG !!! $800 Vs $450. Touchwiz is a win compared to LG UI. Camera a bit better in G2 (Almost Tie). Display (Tie).Ram (2gb same), Battery 22 hrs (S5) 38 hrs (G2). Call Quality (Tie). Design (G2). Bezels (G2). overall IMO if you have more money S5 is a perfect deal 4 u. but if your are budget aware and want to save $350 then G2 is a absolute GEM. AnonD-247149, 24 Apr 2014maybe LG G2 is older to compare to S5.....But Display of lG G2 is still Brilliant, S5's Amoled... morei think u need to read the review again,the new super amoled gives accurate colors. Cold tint ,that is the benefit of g2 screen. why dont you give them sample phone so they can do durability test. they dont get free handsets FYI. nonsense. lg g2 will break with a single drop =) good luck with that. Half price, too big!! G2 better price value for money! AnonD-256055, 24 Apr 2014S5 vs Z2 , please ?Right? I think that's the best comparison right now. The G2 pretty much reminds me of my trusty Sony Ericsson K750. It's a brilliant phone with a great camera, but it's getting a bit old. S5 vs Z2 , please ? AnonD-253374, 24 Apr 2014gsmarena should not just compare both phones one performance,looks,camera... also have to add ... moreThey mention this on the very first page alone. But at least in the end as well. And considering the G2 is half a year older and the S5 just was released and on top of that has internals that cost a good bit more in comparison...Duh the G2 is cheaper. gsmarena should not just compare both phones one performance,looks,camera... also have to add many points like, value for money... when samsung have to cut 40% of their price can it still challanging G2? The overall performance of G2 compare to samsung maybe just 10-20% lower, but the price is 40% lower. then this is definetely a win for LG. Also... gsmarena should also add durability test on both phones. i really want to see which phones can stand fell from 1 m above. thx for the review... samsung and LG are not my choice , HTC and Nokia are. But samsung grand 2 is not a bad phone. please do a review grand 2 compete with desire 816 HTC. Man, LG needs to go IP67. Water Resist Baby. And get the fingerprint sensor and usb 3.0 and AiR View. and heart rate sensor. then we'll talk. AnonD-81824, 24 Apr 2014ha ha .. anybody convinced enough to sell G2 for S5 ?? yeah we all knows s5 is an outdated ... moreHow so when the S5 in a few of the main key aspects of phones is best available preferences aside. And more of an update than other recent devices. And the S4 as a complete package had mostly better tech than the G2. In my country, you can buy 2pcs LG G2 in the price of a single SG S5. No brainer.